Este é um bem renovado, casa histórica perto do centro. Localizado em uma área residencial tranquila ao lado de um belo 'Greenspace' e a uma curta distância da praia, parques, lojas, restaurantes, trilhas de bike / caminhada, Coeur d Alene Resort e muito mais. Todos os quartos estão localizados no primeiro andar: casa de banho completa e 2 quartos com camas queen-sofá cama na sala de estar para acomodações de até 6 pessoas. Você irá apreciar a atenção ao detalhe com estilo de época e mobiliário eclético! Aconchegar-se à lareira a gás e assistir a um bom filme na tela grande (Netflix fornecido) ou ouvir a nossa colecção de música extensa. A cozinha está totalmente equipada e pronta para sua estadia gama a gás, máquina de lavar louça, geladeira porta francês, copa, e também lavanderia completas. Pátio traseiro e quintal são muito particulares com gás bar-b-que e anel de fogo do acampamento. Temos muito orgulho em nossos motivos e você vai encontrar muitas antiguidades interessantes e as coleções. Proprietário mora no local para ajudar com a sua estadia e há uma garagem segura para estacionar o seu bicicletas, canoas, caiaques, motocicletas, etc. Off rua estacionamento para carros. Queremos que sua estadia em CDA para ser o melhor de sempre! O paisagismo no bairro residencial tranquila. Remodelação recente com ênfase na qualidade histórica. Garagem segura disponível para bicicletas, canoas, motocicletas. No proprietário do site para ajudar com a facilitar a sua estadia. Daniel’s home is so lovely and charming. We have stayed in many very nice vrbo homes, but this was exceptionally well cared for and well stocked. It was the perfect break my husband and I needed. We will definitely come back. Dennis was extremely helpful given the short notice we gave him upon securing his property. Highly recommend this house and this host. Thanks Dave-glad you found us!! this was a great home. It's minutes away from downtown CDA. This home is very inviting to making long lasting family memories. We love families and it was really great having yours stay with us!! Come see us again. The property had everything we could need, even a high chair for our little one! Dennis was a super helpful host giving us some great recommendations. We will definitely stay here next time we come to town! The most charming home in town! It was a hot day when we arrived, but Dennis had set the air conditioning so that it was very cool when we got into the house. With my wife and three children, we were able to immediately take some much needed naps after our long journey. The house was the perfect size for our family of five. It is loaded with charming details. Dennis is very accommodating and thoughtful. There are ample fresh towels, even beach towels, and the laundry room is stocked with detergent and fabric softener and bleach...We only had to purchase food to eat. The garden is magical. It is a wonderful place to relax in the morning and have your cup of coffee while children play on the soft grass. It’s a relaxing place to enjoy a glass of wine with friends in the evening twilight. I highly recommend this home as a great place to stay in CDA. Dennis could not be a better host. Thank you to the Krappman family! It was a joy having you!! Easiest stay ever. Lots of little touches to make this home special. We never stayed at a home with the owners onsite before. They made us feel welcome without feeling at all intrusive. Beautiful home inside and out. Estamos perto de Schweitzer Mtn e Silver Mtn de esqui e áreas de lazer, Silverwood Theme Park, lojas e restaurantes que escrever! A uma curta distância do Lago CDA e 40 minutos para os Parques Estaduais de Lake Pend O'reille. Não perca a área de Downtown (a pé) para a exibição de iluminação sazonais, passeios de barco para o Pólo Norte, comida e lojas fantásticas. 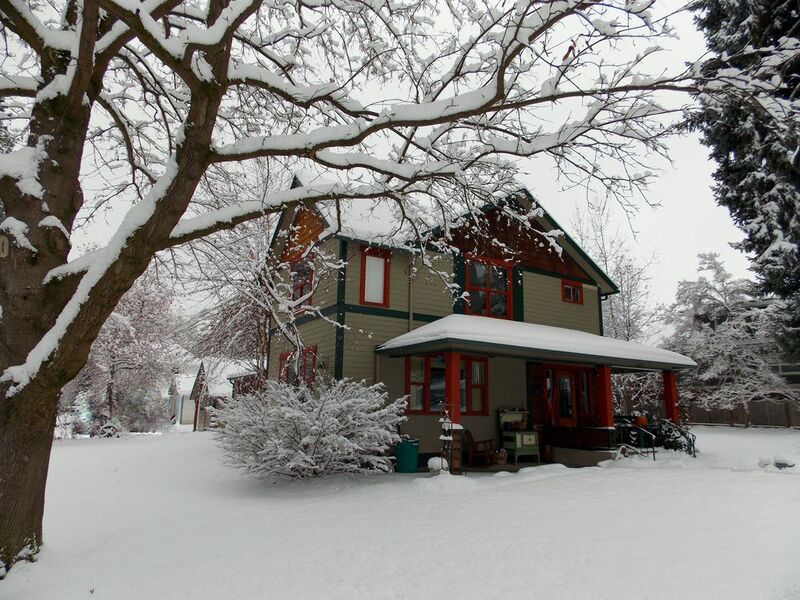 Open year round - see our calendar for more info and don't hesitate to email for WINTER RATES starting @ $125/night The Partner House (as with all Coeur d'Alene rentals) is required to comply with 6% State Tax & 2% Convention Tax. Thanks for your understanding!